There is no better time to explore the eerie side of Old Town Key West than during the run up to Halloween. 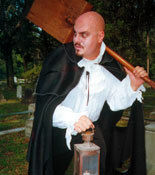 Visitors to America’s most southern city should climb aboard the “Trolley of the Doomed” and let a gravedigger guide them along a Ghosts & Gravestones tour of Key West, America’s fourth most haunted city. These evening adventures offer guests an opportunity to explore the macabre past of this eclectic city when the restless souls and spirits of the past begin to stir. Patrons will hear the sinister tales of creepy Count Karl von Cosel and Elena Mesa, his dearly departed wife. Visitors will be spell bound by the web of intrigue created by stories of lynchings, murder, mayhem, clandestine burials and the island’s many superstitions. The ghostly tour makes its way past some of the island’s most tragic and haunted locations such as the Porter Mansion, the Marrero House and the iconic Hanging Tree. Riders will be particularly captivated by history of the Artist’s House, the former residence of Dr. Robert Eugene Otto. It was in the attic of this home where Robert the Doll was imprisoned by Dr Otto’s wife and where his mischievous life turned sinister. Guests will meet ole poor cursed Robert when the trolley stops at East Martello Fort. They will enter his world, hear his tale of woe, and visit his room in the tower. Visitors will feel the haunting energy as they decide whether or not Robert is possessed.